I spent last week at a conference in Spokane, WA. I learned, laughed, and networked. We rarely got out of the hotel until evening, but that was fine as the sights were still spectacular. I love walking in new places with old friends. Since the conference was scientific in nature, my Baron Fig Experiment made the trip with me, and got considerable use. The green ink pops so I used it to write down those things that I want to come back to—issues, questions, things to think about. My roommate and I were often the first ones at breakfast so I’d sprawl a bit—coffee, water, Nock Co. case wide open, Hobonichi ready for updating. I took a pared down selection of pens, but enough to keep things interesting. 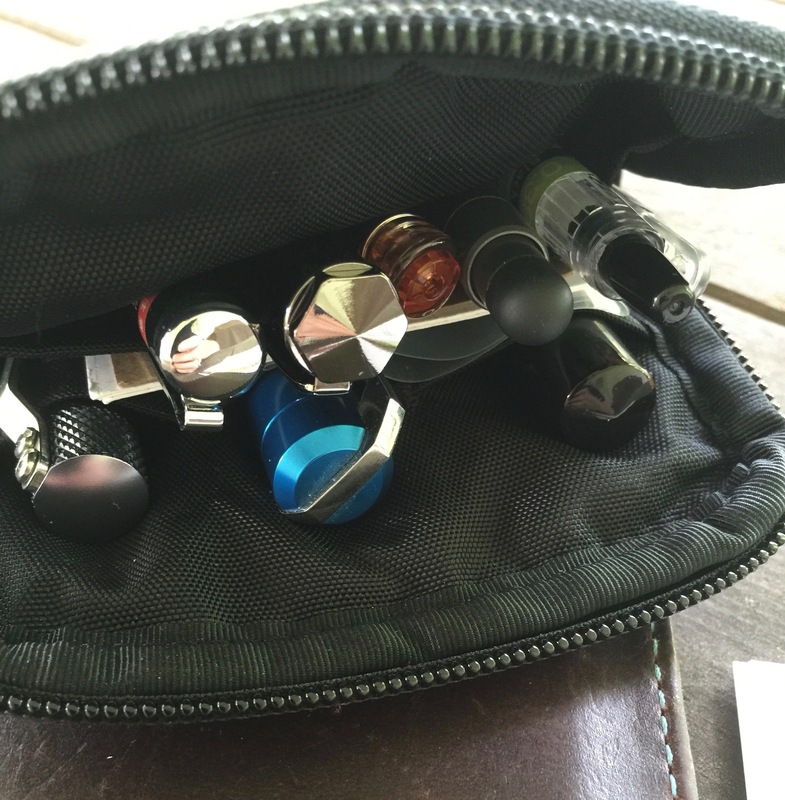 The pens that got the most use were my Lamy Aion (black, fine) and my clipless Karas Kustoms INK (tumbled aluminum with a wonderful titanium medium nib), both filled with Colorverse Cat. I took notes in a Nock Co. A5 DotDash notebook which was the perfect choice in both size and performance. I almost filled it with my conference notes and will use the remaining space to flesh out thoughts and ideas that popped up during the week’s sessions and conversations. But ya gotta have some fun, too. Atticus Coffee & Gifts (222 N Howard St, Spokane, WA) was definitely my happy place. I could’ve spent all of my free time there happily browsing through their selection of books, mugs, t-shirts, unique cards, stickers, pencils (Blackwings! ), pens, and journals, or settled at a cozy table with some cold brew coffee or huckleberry tea. What a cool and comfortable place. Saturday morning, I made one last visit a few hours before my flight back east, and walked away with a nice little bag of souvenirs (t-shirt, novelty pen, tea, travel mug, stickers), as well as a much needed caffeine boost. Flights went well, the weekend went fast, and Monday arrived as it always does. A friend on Facebook said, “The Monday after a week away is the Mondayest Monday ever.” She’s so right—re-entry is hard. Well, I thought, if I have to work, I’m using my new pen. Which is exactly what I did. And you know what? It kind of helped. Are YOU having a Monday? Do you need a rubber feather pen? Atticus Coffee & Gifts doesn’t appear to have an online presence, but I see the pen is available HERE. There’s also a grass pen that I should’ve bought, too. You know, for those pesky Tuesdays. Grocery shopping is a necessary evil. I don’t hate it, but I don’t love it, either. We go once a week, usually on Friday evening, to avoid the dawdling hordes that descend on Saturday. We like to get in and out as efficiently and quickly as possible. But then, who doesn’t? Oops…I wrote cherries twice. I must really want them. I use a program called MacGourmet to digitally organize recipes on my desktop iMac. What’s really great is that I can export the recipes from MacGourmet to DropBox as .txt files so that they’re easily accessible via my phone. 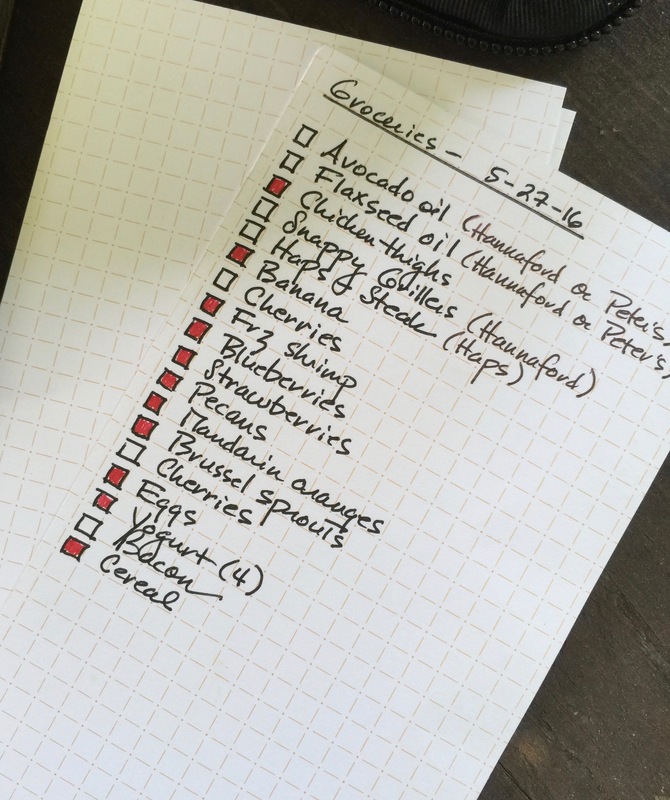 So even if we’re eating out, as we often are on a Friday evening, I can quickly pull together a grocery list for the coming week. As we brainstorm our needs and wants, I record the list on a Nock Co. DotDash 3×5 card, while also sketching out a tentative menu plan on the back of the same card. We do this every single week. And if we can’t, because of a Friday night event, we feel off-kilter. Creatures of habit, is what we are. 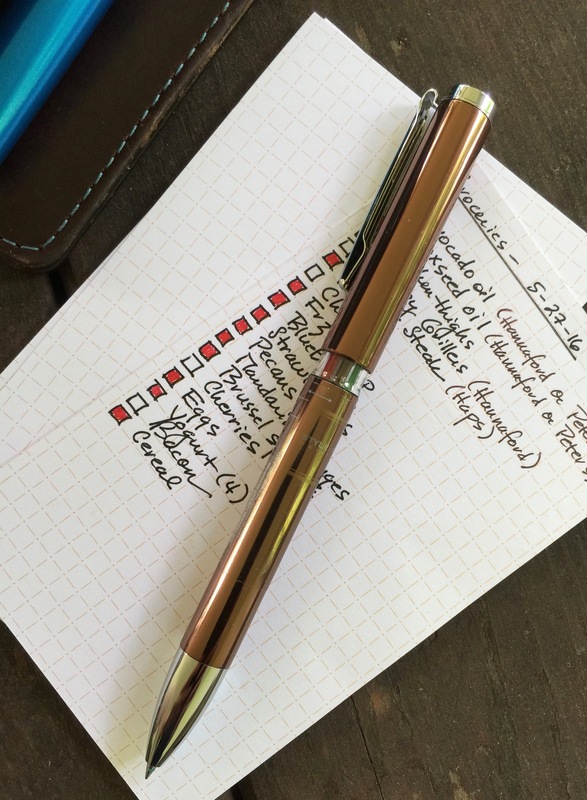 The pen I chose to write out my list this Friday was the INK rollerball by Karas Kustoms. (Huh. I’m not seeing the rollerball version on their site at the moment.) The Schmidt P8126 liquid ink refill is bold and smooth. 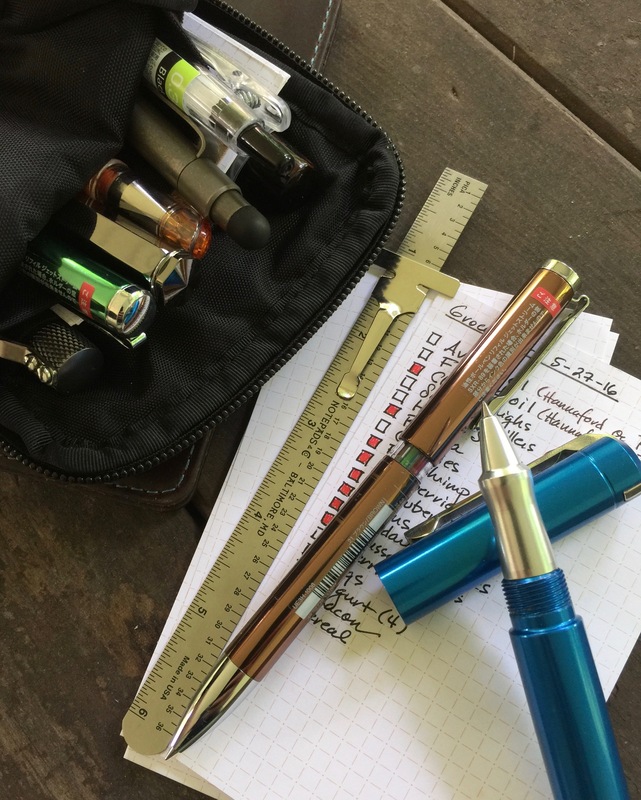 The INK rollerball is a great writer that’s as fun to look at as it is to hold and use. 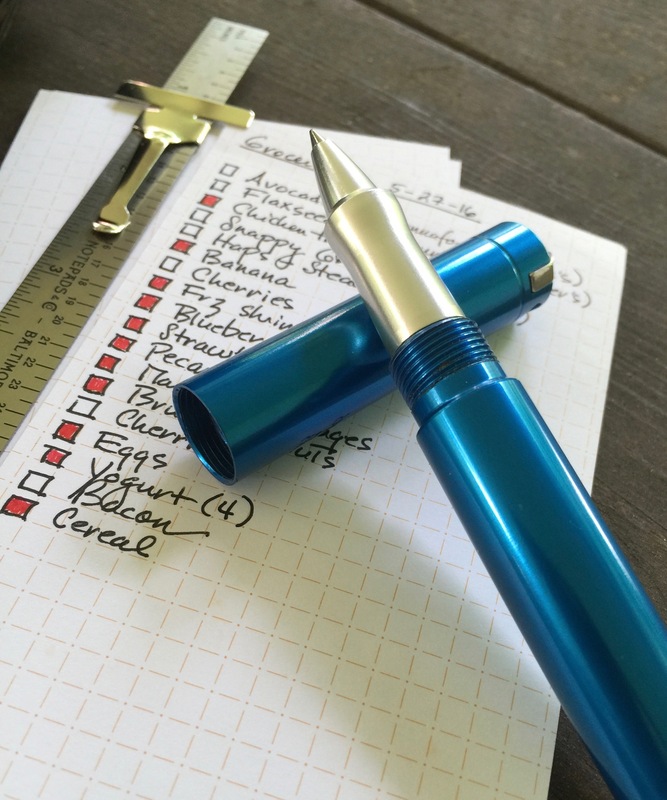 All of this pen goodness distracts you from the fact that you’re preparing for a chore. The INK glides. Your mind goes to a happy place. I’m pretty sure endorphins are released. This is a good thing. The list is made. We head to the store. Time to get down to business. As we pick up each item on the list, I color in the little checkbox with red or orange ink. Yes, I could just check the box. I suppose. But the completely filled in boxes appeal to me, AND I get to use yet another pen. 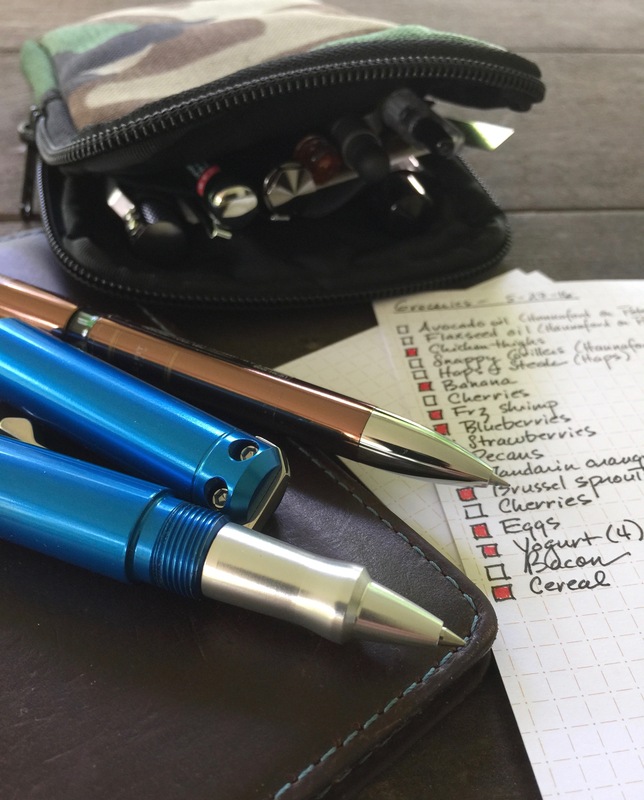 This week it was my Uni Style Fit 3 Color Multi Pen outfitted with brown, green, and red 0.38mm gel refills…a super sweet and customizable pen that I’ll write about in more detail before too long. (Thomas Hall got me hooked on these. Thomas, Master Enabler.) The Uni Style Fit refill colors are strong, and the ultra-fine point is wickedly smooth. The colored boxes make it abundantly clear what we’ve loaded into our cart and what we’re still trying to track down. Plus it’s fun to color, even if it is just a little box. If we have to hit more than one store, as we almost always have to do, I jot the alternative store name next to the item. You know, for fun. Despite this post’s name, I don’t really find grocery shopping all that gross. Unless it’s on the Saturday of a holiday weekend. Then, ick. But it is a chore that will always be there, week after week. The trick is to make it as palatable and efficient as possible. Using my pens and favorite 3×5 cards, I’ve nailed down a system that works for me, while injecting some fun into the process. Now to find those elusive cherries.